Full Disclosure: We may be compensated when you click on links to credit card products from our advertising partners, such as American Express, Chase, Citi & Barclays. Opinions on this site are ours alone, and have not been reviewed or approved by the issuer. See our Advertiser Disclosure for more details. Thanks! Next Article New Emirates First Class Suite Is a Game Changer! In the few short years JetBlue has been around, this airline has become quite popular. 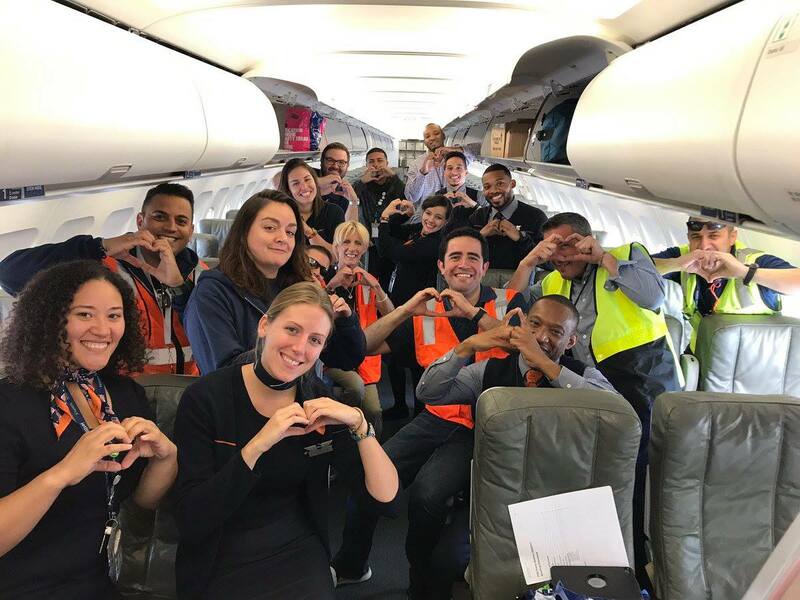 Founded in 2000 with the goal of “bringing humanity back to air travel,” JetBlue has won quite a few awards, including a number in the customer satisfaction realm. What are JetBlue’s baggage policies like? Will I get snacks on JetBlue? …and a whole lot more! We’ll outline basic company info, ticketing options, how to earn TrueBlue points, baggage fees and other extras, seat specs, inflight amenities — and a big dose of consumer satisfaction information. Read on to find out more about JetBlue Airways! While JetBlue is considered a low-cost carrier, there’s nothing minimal about the basic flight experience itself! JetBlue includes brand name snacks, entertainment, power outlets, and more on all their flights! You will, however, pay extra for checked bags, just like with other low-cost carriers. So How Do These 4 Fares Differ? Blue (Basic): Blue is JetBlue’s most basic fare. You get a carry-on and a personal item but no checked bag. Additionally, as we mentioned above, you get all of the basic perks allotted to all JetBlue flights like great legroom, snacks, Wi-Fi, movies (flights 2+ hours), etc. As the chart shows, you will pay for any changes made to your itinerary. Blue Plus: Blue Plus is a small step above Blue, in that you’re allowed 1 checked bag included in the fare. You can also earn 4 bonus points per dollar (vs. 3 for Blue) when you book online. Again, as the chart shows, you will pay for any changes made to your itinerary. Blue Flex: Blue Flex is the most generous of the basic fares. Passengers are allowed 2 checked bags included in the fare and you can earn 5 bonus points per dollar for booking online. Additionally, no fees are applied for cancellations or changes to the booking. Blue Flex also includes expedited security where applicable. 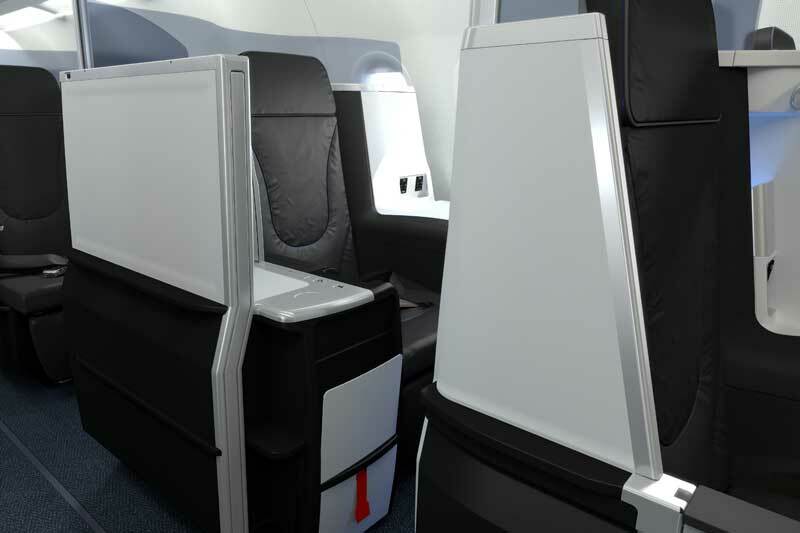 Mint Experience: JetBlue Mint is clearly the most glamorous ticket option, but it’s only available on select flights. With JetBlue’s Mint Experience, customers are allowed 2 checked bags, but will not earn additional bonus points over the standard 3 per dollar for booking online. Also, as you’ll note above, it appears change/cancellation fees do still apply. That being said, passengers flying Mint get the added benefits of dedicated check-in counters, expedited security (where available), early boarding, lie-flat seats, artisanal dining, priority baggage, 15″ flat screen TVs, amenity kits, and more. There are plenty of ways to earn JetBlue TrueBlue points, but the quickest and most efficient way is through credit card sign-ups and spending. Here’s the good news: there are a couple of options to choose from. Plus, you then have the option of earning extra points through category bonuses! Need even more points? Try shopping via JetBlue’s portal, dining out with JetBlue’s dining program, or utilizing JetBlue for other travels, car rentals, partner hotels, etc. Since JetBlue doesn’t have any airline partners, remember that points you earn specifically for your TrueBlue account are only redeemable on JetBlue flights. You can learn more about Mosiac Status, the JetPaws program, JetBlue’s innovative customer interaction techniques (including their loyalty badges), and more in our JetBlue TrueBlue review. JetBlue is a low-cost airline, so while some perks are included, you will find certain extra fees and charges here and there. As with any other low-cost airline, considering the add-ons in advance will keep you from undue disappointment once you reach the final purchase page for your fare. While they do charge for bags if customers choose the basic fare, JetBlue’s baggage policy is pretty straightforward. If a bag is overweight and oversized, note that both fees will apply. JetBlue does have some special considerations relating to sporting equipment. Generally, certain pieces of equipment can count as one of your checked bags without being charged oversized fees. Hot Tip: JetBlue has partnered with Bags VIP (a luggage delivery service) if you’re interested in relieving the stress of picking up your luggage at the carousel. A number of the added fees can be seen in the fare chart above. In an effort to be thorough, we’ve also listed them below, in addition to some other add-on expenses not shown above. First checked bag free for the primary cardmember on JetBlue-operated flights. If you’re flying JetBlue regularly, these savings will really add up! Your other option is to use the Barclaycard Arrival Plus® World Elite Mastercard®, since you can use your miles to cover any qualifying travel purchases of $100 or more, including baggage fees. As it turns out, the general feedback about flying JetBlue is pretty darned positive. So what will your inflight experience look like? 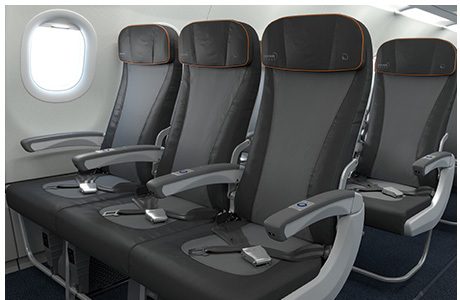 When it comes to comfort, JetBlue claims to have the widest seats and most legroom in coach (based on average seat width/pitch across the industry). 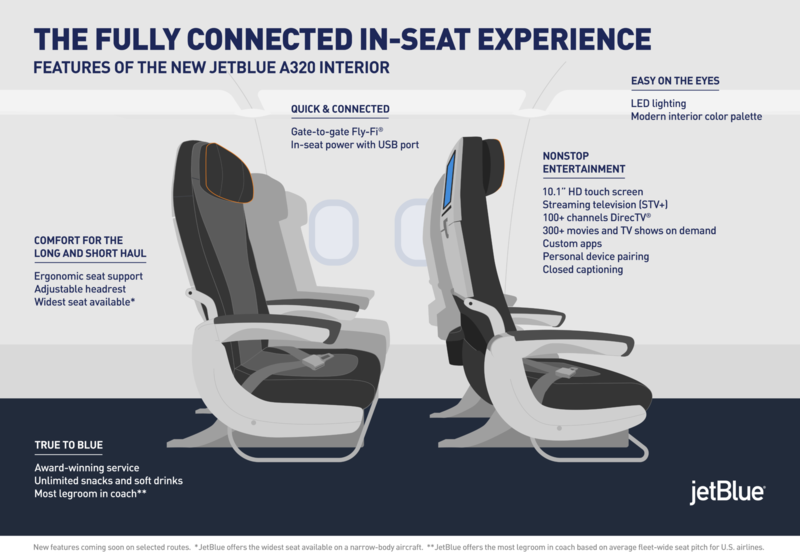 JetBlue operates a fleet of narrowbody jets with 2-3 different seating options. The number of seating options available and pitch/width measurements will be based on the aircraft/route you’re flying. If you’re interested in finding the best seat on the plane, the good people at SeatGuru have some great insights! 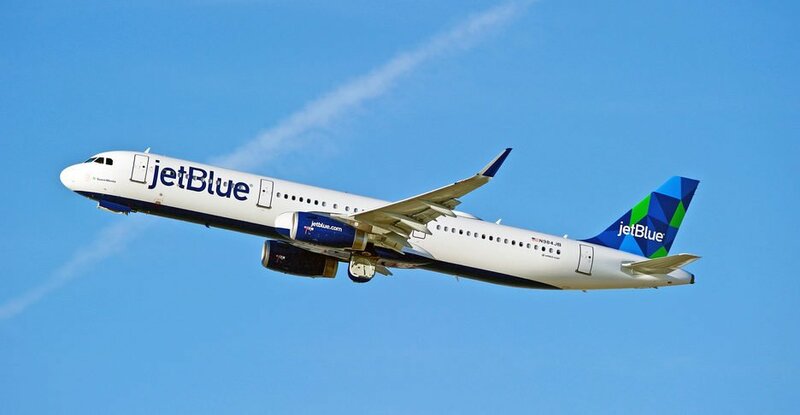 JetBlue has recently done a refresh of its A321 V2, and plans to begin A320 restyling soon. They anticipated an early 2017 start, but that plan has hit a couple bumps along the way. As you can see in the photos below, there’s quite a big difference in terms of style. 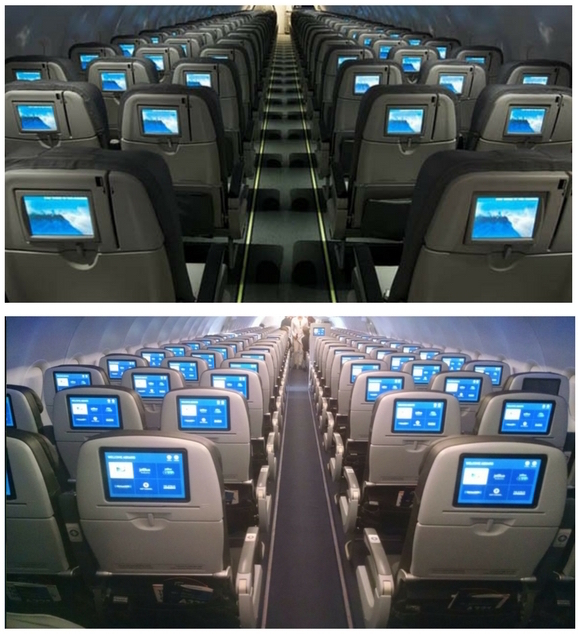 You’ll find the older A320 cabins look like the top photo, and A321 refresh looks like the bottom photo in both cases. 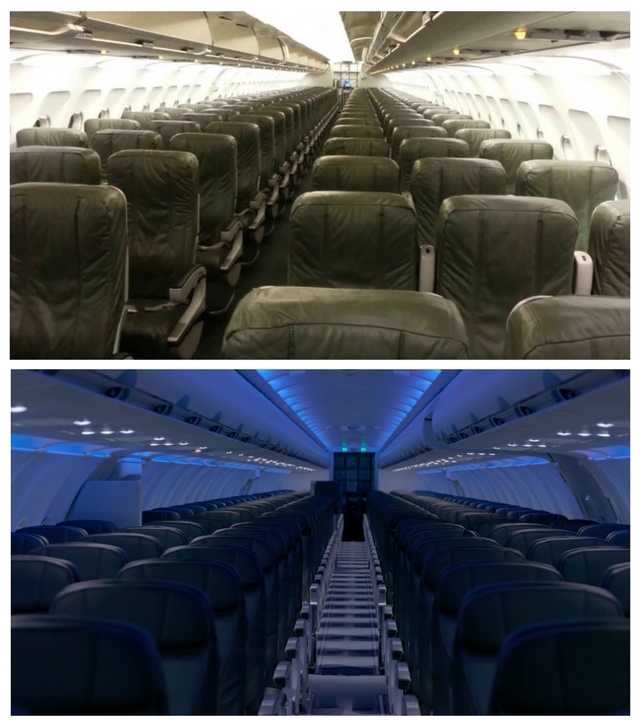 Basic economy in A320 vs. A321 refresh. Images courtesy of yourmileagemayvary.net. 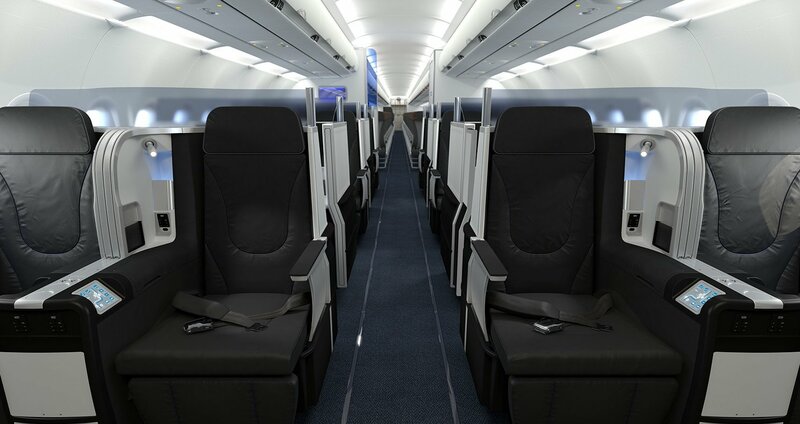 With the refresh came a slight reduction in pitch, but JetBlue claims with their new “ergonomic seats” it won’t feel like you’ve lost the inches. The new seats also come with 10.1″ touchscreen TVs. Basic economy in A320 vs. A321 refresh. Images courtesy of yourmileagemayvary.com and jetblue.com, respectively. The refresh also brought AC power outlets to every economy seat on the A321 planes. The current A320 series and the E-190 series do not have AC power outlets. Even More Space seats. 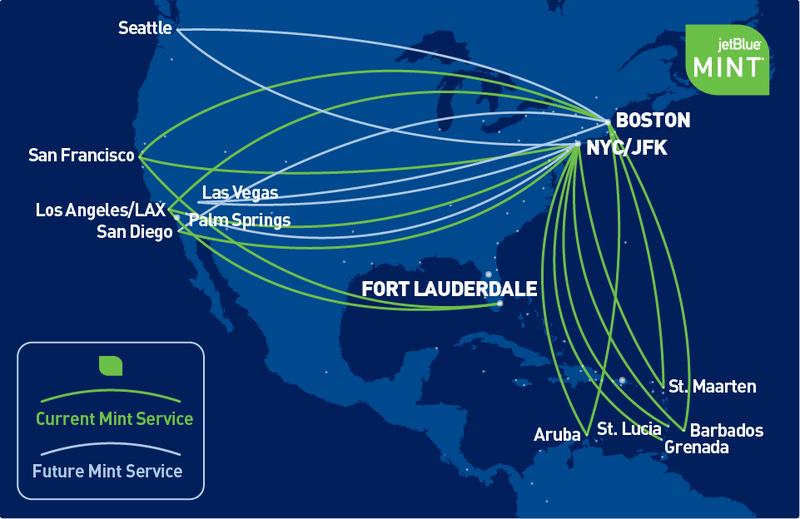 Image courtesy of jetblue.com. 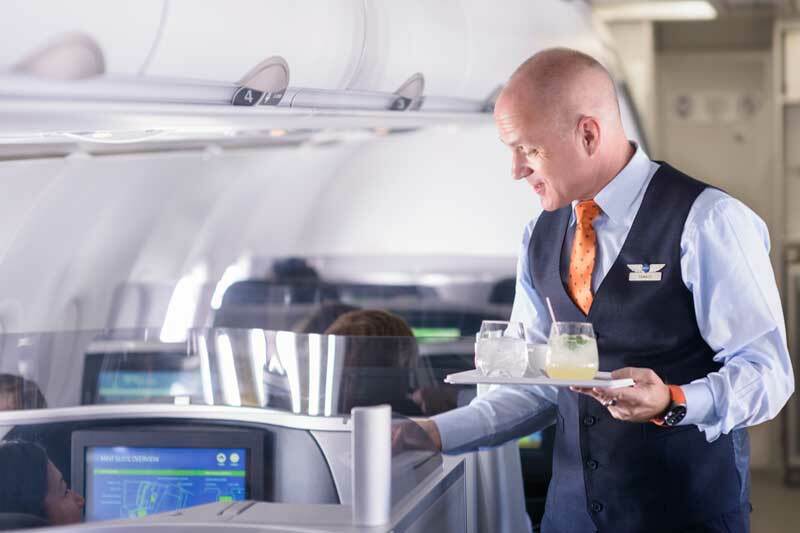 With the Mint Experience, JetBlue claims to give customers the only private suite among U.S. airlines and the “longest lie-flat seats on domestic premium flights,” at 6′ 8″. 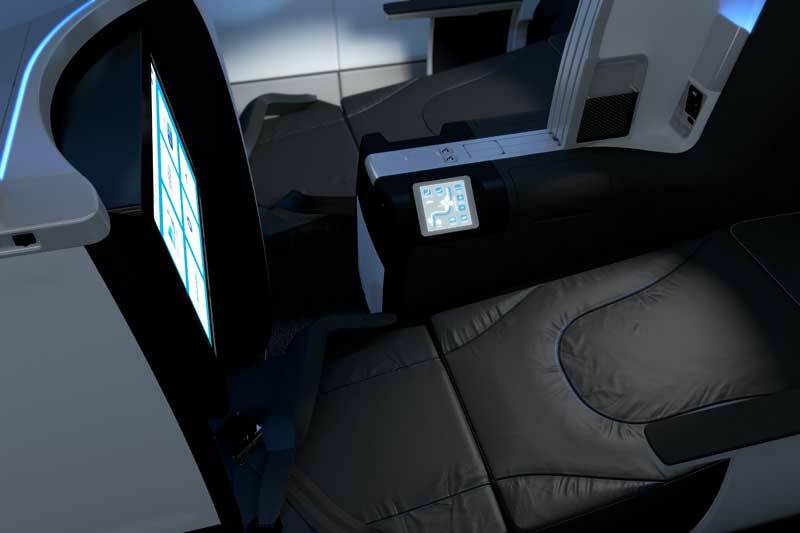 The cushions of the seat are also adjustable, and each seat has a 15″ touchscreen TV. Mint seats. Image courtesy of jetblue.com. The Mint Suite. Image courtesy of jetblue.com. Passengers get fully lie-flat seats with Mint Experience. Image courtesy of jetblue.com. *Not available on flights outside the contiguous U.S. Specially trained staff members cater to Mint Experience passengers. Image courtesy of jetblue.com. Hot Tip: Forin-depth information on JetBlue’s Boarding Groups & Process, see our article here. JetBlue has a very positive history when it comes to customer satisfaction. In fact, JetBlue Airways has taken the top spot in the J.D. Power North America Airline Satisfaction StudySM for 12 consecutive years — an incredible feat! Of course, you’ll still find complaints — customers can’t be happy all the time — but JetBlue certainly has fewer than most! While JetBlue consistently leads the pack when it comes to customer satisfaction, there will always be complaints. So where do the majority stem from? The DOT Air Travel Consumer Report from August 2017 ranked JetBlue 5th best (of the 12 major U.S. carriers) relating to consumer complaints from January-June 2017. While 5th best may not seem great, that’s still only 1.4 complaints per 100,000 enplanements. Comparatively, low-cost competitor Southwest Airlines came in best of 12 with just 0.5/100,000, while competitor Spirit came in worst of 12 with 6.74/100,000. The same DOT analysis ranks JetBlue 3rd best of 12 when it comes to mishandled baggage for Jan-June 2017, so they’re coming in quite favorably in that category as well. However, when looking at data related to passengers who were denied boarding for that same time period, JetBlue ranks 10th of 12 — not too great! As you can see from the data above, JetBlue’s biggest issue seems to be Flight Problems, making up over 45% of the complaints. The DOT August 2017 Air Travel Consumer report ranks JetBlue 11/12 for OTP. Specifically, JetBlue flights arrived on time 72.2% of the time (calculated from reporting airports for the 12 months ending June 2017). The most chronically delayed routes appear to be JFK>SYR followed by BOS>JFK, JFK>CHS, and LGB>SFO. In June alone, JetBlue flights were on time just 60.6% of the time (from 67 reporting airports). Of the 39.4% remaining flights, the largest delay issue was related to late arriving aircraft at 14.97%. Air-carrier delays (i.e., the cause of the cancellation or delay was due to circumstances within the airline’s control) made up 10.13%, and the National Aviation Systems delays made up 10.71%. The remaining percentages were due to extreme weather, security delays, diversions, and cancellations. Concerning cancellations, JetBlue flights appear to have been canceled 2.5% of the time (of the same 67 airports reporting). This places the airline 11th of the 12 carriers, coming in just above Spirit. All in all, it’s tough to beat JetBlue Airways when looking for an enjoyable low-cost airline experience. JetBlue includes quite a few standard inflight economy perks and provides an impressive “business class” product with their Mint Experience. Additionally, they have a fairly decent frequent flyer program that’s built for optimal user interaction. 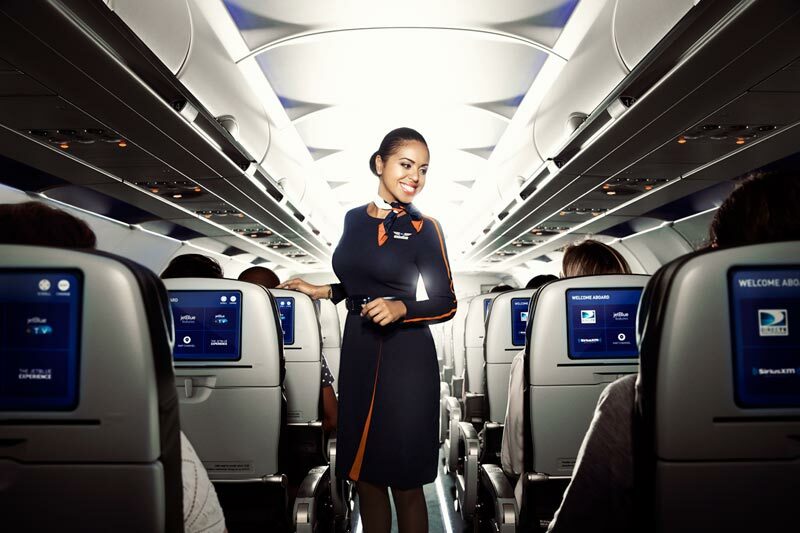 Plus, JetBlue proves their worth with high consumer ratings, tons of positive reviews, and countless awards. So it seems that what JetBlue lacks in on-time performance, they more than make up for in other areas. We’ll take it! What was helpful about this page? What did you not like about this page? Please confirm that you're not a robot. We take your comments very seriously as they really help us to improve the site. Erin currently maintains her status as Alex's adventure-seeking partner-in-crime and contributes to Upgraded Points through content creation & relationship management. She caught the travel bug just after high school when her grandmother took her on a two-week, whirlwind trip around Europe. That was that - she's been gallivanting around the globe ever since (22 countries & counting)! Want The Best Lounge Access? The Platinum Card® from American Express is the best card for airport lounge access; no other card even comes close. Get into more than 1,200+ airport lounges across 130 countries including the amazing Centurion® lounges. We leverage $1,500+ in value each year with The Platinum Card®. New Emirates First Class Suite Is a Game Changer! Quizzle Review: Legit Free Credit Score or Scam? Disclaimer: Any comments listed below are not from the bank advertiser, nor have they been reviewed or approved by them. No responsibility will be taken by the bank advertiser for these comments. I lost a receipt for paid luggage. How can i get this by email? I need to sent to my company. Hello Chatdao. Please be advised that we are not JetBlue Airways. We are a blog specializing in miles and points related content. You will want to contact JetBlue directly to request a copy of your luggage receipt. 1 800-861-3372. Email needed if you'd like comment updates. It will NOT be published. 🏆 80,000 Bonus Points. Our #1 Business Card in 2019. New To Points & Miles? Get FREE Updates, Tips & Strategies! © 2019 Upgraded Points™, LLC. All Rights Reserved. Disclaimer: Upgraded Points, LLC and its website, UpgradedPoints.com, provides information on credit cards, reward programs, travel information and ancillary information concerning travel and credit cards. The information provided is for informational purposes only and should not be considered financial, tax or legal advice. Upgraded Points, LLC uses reasonable efforts to maintain accurate information on the site — and prior to applying for any credit card offers found on UpgradedPoints.com, all visitors should review other features of such credit cards including but not limited to interest rates, annual fees and transaction fees, and should determine the suitability of such credit cards considering their own individual financial position. Advertiser Disclosure: Many of the credit card offers that appear on this site are from credit card companies from which we receive compensation. This compensation may impact how and where products appear on this site (including, for example, the order in which they appear). This site does not include all credit card companies or all available credit card offers. For more information on our advertisers, see here. Editorial Disclosure: The content featured on UpgradedPoints.com has not been provided by the credit card companies mentioned. Any and all options, reviews, comments and analyses are the responsibility of the author(s) and not any Advertiser or credit card issuer. Many of the credit card offers that appear on this site are from credit card companies from which we receive compensation. This compensation may impact how and where products appear on this site (including, for example, the order in which they appear). This site does not include all credit card companies or all available credit card offers. For more information on our advertisers, see here.